Reuse has often been touted as an approach to solving issues, such as time to market and solution quality. Reuse over the years has taken on a number of forms, ranging from copy and paste of code, reuse of objects, reuse of components, to more recently the reuse of services. However, we still find ourselves running late on our projects (when we do deliver) and having poor quality. Unfortunately, we often underestimate the effort and forethought needed in creating a successful reuse program within an organization. Successful reuse is not something that happens by accident or by just wishing it to be true. 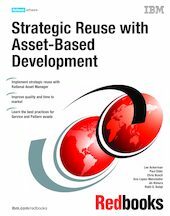 This IBM Redbooks publication is focused on a best practice-based approach to strategic reuse within software delivery, known as Asset-Based Development, that will assist in addressing these issues. We do not contend that this is the “silver bullet” that will fix all of the issues that ail software delivery. However, Asset-Based Development is a key tool that needs to be found within the tool chest of all software development organizations (or at least those that want to succeed). This book is intended for all individuals who want to implement or understand strategic reuse with Rational Asset Manager.